The Man with the Golden Gun (1974) is the ninth spy film in the James Bond series, and the second to star Roger Moore as the fictional MI6 agent James Bond. An adaptation of Ian Fleming’s novel of same name, the film has Bond sent after the Solex Agitator — a device which can harness the power of the sun. 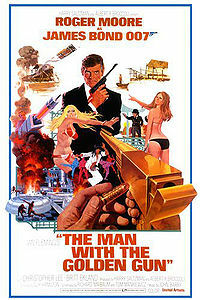 He teams up with agent Mary Goodnight against Francisco Scaramanga — the titular “Man with the Golden Gun”. The action culminates in a duel between them. The Man with the Golden Gun was the fourth and final film in the series to be directed by Guy Hamilton. The script was written by Richard Maibaum and Tom Mankiewicz. The film was set in the face of the 1973 energy crisis, a dominant theme in the script — Britain had still not yet fully overcome the crisis when the film was released in December 1974. The film also reflects the then popular Kung Fu film craze, with several kung-fu scenes and a predominantly Asian location. Reviewers praised Christopher Lee’s performance as Scaramanga, but criticized the comedic approach.